In Lectio Divina, we read, we seek to understand with the help of a commentary, we ponder, we take time for stillness and we respond. It is a way of life, not a method of prayer. Take the Mother of God as your model, the one who brought forth the Word made Flesh, Our Savior Jesus Christ. Lectio: Read the First Reading from the Acts of the Apostles, chapter 10, verses 34 and 37-43. Read the text in a reverent way. The Word of God is sacred. Let us give ourselves to the sacred text and open our hearts to the power of the Holy Spirit calling us forth to respond. Be aware of the Holy Spirit playing on the fibres of your heart as you read. This is the true “oratio” (prayer) of Lectio Divina. Meditatio: A little background to the text, so that we understand it and can make an informed response to it. Luke, the author of Acts, recounts the story of the conversion of Cornelius and his family and employees, and probably extended family, if they were present. The text says, “Cornelius and his household…” Peter, a firsthand witness to the life and teaching of Jesus, addresses this family. Cornelius is a centurion in the Roman army. This paints the picture more dramatically. The whole story spans 10:1-11:18. The familiar “call to repentance” which is a characteristic of such a sermon, is replaced by the “kerygma of universal forgiveness under the auspices of the one appointed judge of the world”, and this matches the conclusion of Paul’s speech “to the Gentile Athenians” in Acts 17:30-32, and Paul’s argument in 1 Thessalonians 1:10.” The 2 “universality of Jesus’ judgment, as of his lordship (v. 36), is the bracketing motif for the sermon and its principal point of connection with the context.” The same is said of verse 43. Verse 43 also completes the text’s recurrence of the Gospel of Luke, chapter 24:44-48.” (These notes have been summarized from 44:65, in the New Jerome Biblical Commentary). It will give us a greater depth of understanding and prayer, if we pause to read the extra texts mentioned here. After this, we can read the text again, and take a long time to ponder on the overall message. Listen to the Holy Spirit placing unction on words and phrases as they come to you and challenge you. Build into each day some quiet time. Be still before the Lord. After pondering over many hours (days), you will want to make your response. I share my response in Evangelizatio 1. Responsorial Psalm: Psalm 117 The response is: THIS IS THE DAY THE LORD HAS MADE; LET US REJOICE AND BE GLAD. Psalm 117 is a processional song of praise. Block 3 is the Easter block: “The stone which the builders rejected (crucified) has become the corner stone of every Christian’s life. Christ is that cornerstone, and the cornerstone on which our lives are built, and which keeps us firm, and stable and faithfilled. 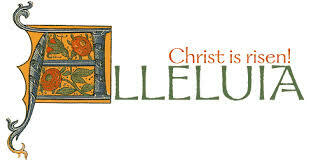 Lectio: Read the Second Reading, from Colossians 3:1-4. Meditatio: Understanding the text, so that we can make an informed response. Colossians 2:6-15 is about the tradition of Jesus Christ. Colossians 2:16-23 is about the body of Christ – the Christian community. Colossians 3:1-4 “sums up the teaching of the preceding section, [and is] a foundation for the detailed ethical instruction that follows on after 3:1-4.” For us as Christians today, these verses are a powerful reminder of what Jesus has done for us. And because of this we are given an exhortation to think about the things that matter. It might be compared with the difference between an eagle and a chicken. An eagle soars high in the skies. A chicken goes about busily cleaning up the vegie patch. We are called here to be eagles, rather than chickens. The reason Paul gives is: “…because you have died, and now the life you have is hidden with Christ in God.” In case verses 3-4 pose a problem, the meaning is rather simple (at least on paper): “Although the resurrection has taken place, all the conditions of the end time are not present. There is still a gap between what is on earth and what is in heaven, and fulfilment of the body of Christ is hidden ‘with Christ in God’; but finally, Christ and the believers will appear in glory. (54:22). Take time over the text before making your response to it in the days ahead. I share mine in Evangelizatio 2. The Gospel Verse is from 1 Corinthians 5:7-8. CHRIST HAS BECOME OUR PASCHAL SACRIFICE; LET US FEAST WITH JOY IN THE LORD. 3 Lectio: Read the Gospel text from John 20:1-9. Meditatio: A little background to the text, so that we may gain an understanding, and make an informed response. This is the story of the resurrection of Jesus. There are three characters: Mary Magdalen, Peter and John. Mary Magdalen had been one of the women who kept vigil at the foot of the cross. (John 19:25). Most commentaries note that there are various versions of this event. Staying with the one before us is where we are meant to be and is what God has given us for holy reading, prayer and response this Easter. The positioning of grave cloths show that the body has not been stolen. So, where is it? Where is Jesus? While there is a lot of symbolism in the story, the head cloth with its special treatment is loud in divine energy. One could say (not based on fact or tradition), that this cloth has been wrapped around the head of the Savior of the world, and with great reverence, is placed apart from the other cloths. The other cloths are on the ground, but the headcloth is a sacred one. This is a spiritual interpretation. Stand back from the Gospel and ponder. Hear the words: BE STILL AND KNOW THAT I AM GOD. Allow the Holy Spirit to play on the fibres of your heart like a harpist in order to bring forth the most beautiful melody of your response to God. I share my response in Evangelizatio No. 3. Evangelizatio is my LIVED RESPONSE to the sacred scriptures given to me each week by the Church for my formation as a Christian. If I don’t respond, they are merely texts on a page. When I do respond, they are my life. 1. I am called to respond to the words: “It is to him that all the prophets bear this witness – that all who believe in Jesus will have their sins forgiven through his name.” I only have to ask one question and give one answer: Do I believe in Jesus? Yes, I do. And because of this my sins are forgiven through his name, his sacred name. One of the entries in our social justice calendar this week, is the murder, in 1998, of Bishop Juan José Gerardi Conedera, in Guatemala. Bishop Gerardi was a human rights activist, and gave his all to exposing what the Guatemalen people had suffered in the 1980s. Two days after publishing a document with his findings, and exposing the truth, he was bludgeoned to death (April 26, 1998). There was no doubt that someone like Bishop Gerardi believed in Jesus, and in the forgiveness of sin which Jesus gave to his believers. Jesus was also killed, not by being bludgeoned, but by being nailed to a cross. Jesus gave his life for humankind. Bishop Gerardi, in imitation of his Lord, gave his life for his Guatemalen people. 2. I am responding to the exhortation of Paul: “Let your thoughts be on heavenly things, not on the things that are on the earth…” The reason for this exhortation follows on. Looking at this exhortation as a call to conversion, I am helped by Sr. Joan Chittister in her book, “Illuminated 4 Life, Monastic Wisdom for Seekers of Light”. In the chapter on the Call to Conversion, she understands conversion as: “…purity of heart, singlemindedness of search, focus of life…we must become converted to the consciousness that makes us one with the universe, aware of the sacred in every single element of life.” The poet William Blake wrote: “To see a world in a grain of sand…” Even a grain of sand is sacred, and is created by God and is loved by God. You may want to revisit the symbol of the hazelnut (Julian of Norwich). So, when Paul exhorts us to focus on the things above, we begin to see the beauty in a grain of sand, a wildflower, a pebble, a seashell. It is all there for us. 3. I am responding to three passionate people running, proclaiming, believing that Jesus has risen from the dead. The passionate Magdalen, with her Lord to the last at the foot of the cross. The impulsive Peter, aware of his betrayal at the end, and now running with John to the tomb. John outran him. The difference in characters then emerges. John arrives first, looks from a distance and because of his faith, goes no further. The impulsive Peter goes right inside and sees for himself. It seems that there is room for all of us – all characters, all doing things differently, all responding in faith as best we can. No one way is better than any other way. Jesus is there to meet us no matter how fast or slow we can run to meet him. He will wait for us, and take us in his arms, the outstretched arms waiting to embrace all humanity. 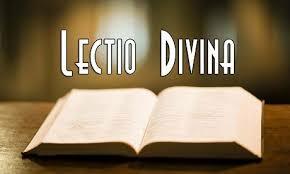 Lectio Divina is Holy Reading – reading of the Sacred Scriptures It is a way of life, not a method of prayer. It is about reading (and listening), reflecting, praying in tune with the Holy Spirit within me, resting in God, and responding in the way I live. Wishing all our Oblates and friends blessings of joy, new life and hope on this Easter Sunday and throughout Eastertide!